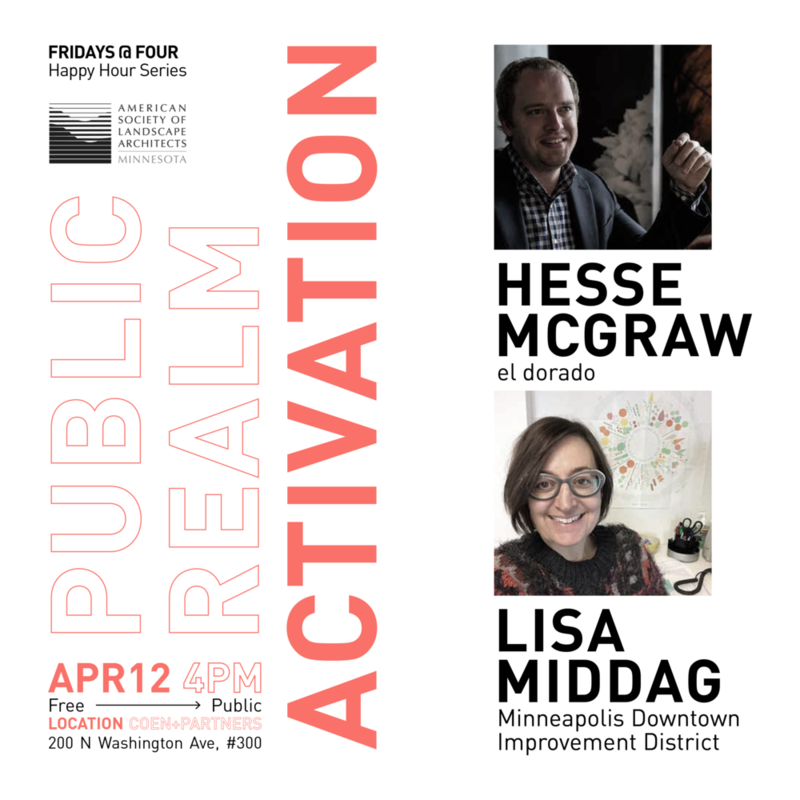 This Friday we are looking forward to a conversation on public realm activation led by two amazing speakers, Hesse McGraw of el dorado architects and Lisa Middag of the Minneapolis Downtown Improvement District. As part of an ongoing collaboration with ASLA-MN, our Fridays at Four conversation series will see its fourth session this Friday, April 12th. Hesse is a partner of el dorado inc and occupies a unique role within the cross-disciplinary practice. Hesse is a curator and writer, and most recently served as Vice President for Exhibitions and Public Programs at the San Fransisco Art Institute. His curatorial practice is acclaimed for shifting organizations into springboards that expand the agency of artists beyond the gallery, reach new audiences, and embrace unexpected contexts. Lisa is an urban planner who collaborates with communities to support sustainable, vibrant, and walkable public spaces through creative placemaking and community development. As Director of Nicollet Activation for the Minneapolis Downtown Improvement District, she is responsible for placemaking along the city’s historic downtown pedestrian/transit street. We hope you’ll join us Friday for this exciting conversation. We’ll begin around 4pm. As always, the conversation is free, public, and supplemented with snacks!